Champion Taekwondo offers a wonderful martial arts experience to children and adults of all abilities. 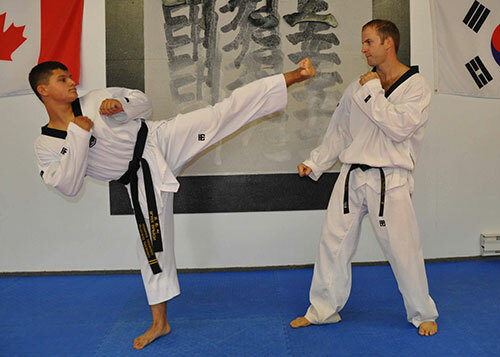 We offer Tae Kwon Do training for men, women, and children of all ages. There are many facets to Taekwondo, and while physical conditioning and self-defense skills are certainly advantageous, there are other far-reaching benefits, including mental fitness, personal discipline and self confidence. It all has to do with the development of the Tae Kwon Do spirit, which carries over into all aspects of a person's life. Champion TaeKwonDo Penticton [Jay Park] is a World Taekwondo Federation affiliated school. Joining the original Valleywide Taekwondo Academy as an instructor in 1997 and eventually taking over ownership of the TaeKwonDo school, Master Michael Adams has coached students to both provincial and national Taekwondo championships. Master Mike Adams is a 5th Degree Black Belt who trained under Grand Master Jay Park. Master Adams is ably assisted by several high ranking instructors who ensure that our taekwondo academy provides a great learning place for children and adults alike that is also fun!